These calf straps fit most sizes of wheelchair. They are extremely quick and easy to fit, with a durable Velcro fastening system. 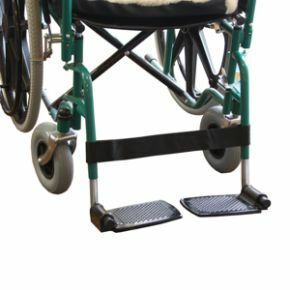 Correctly placed, wheelchair calf straps provide comfort and support while in transit. They keep the legs in an ideal position at all times. A fleece calf strap option is also available, for those who would benefit from extra padding. Fastens to wheelchair with velcro. This strap is totally perfect for my needs. 100% happy with my purchase and delivery time, the price is very reasonable too, even with the conversion rate (GBP -EURO).Will definitely be purchasing again in the future. Keep up the good work guys, Happy New Year, all the best for your business in 2016. Stops legs slipping off foot plates and getting painfully caught.Good product. Promptly sent.